Perfectly matched, natural looking brows in second! Apply lightly for subtle look or darker for bold, sassy look! Shape and define for a fuller brow or fill in sparse eyebrows. 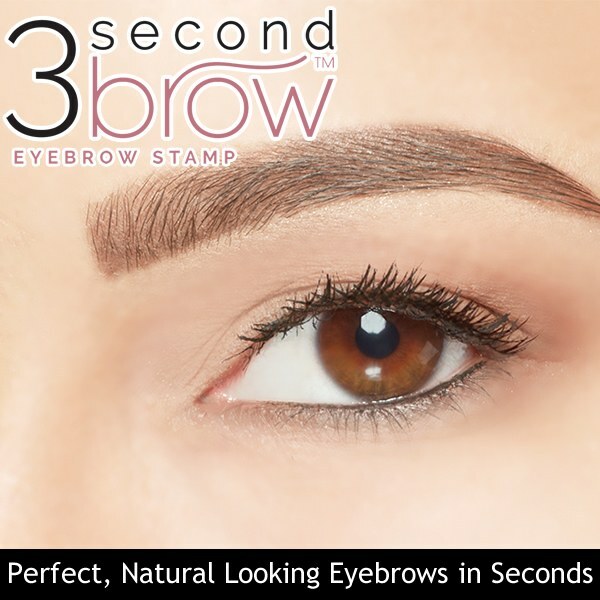 The 3 Second Brow eyebrow stamp is the perfect, easy way to natural-looking eyebrows in second! As seen on TV 3 Second Brows gives you perfectly symmetrical eyebrow in seconds. Whether you want to shape and define for fuller brows or fill in sparse eyebrow it&apos;s easy with three second brow. Gently press stamp into the brow powder, place stamp on top of eyebrow and enjoy the beautiful brow you always dreamed of. Apply lightly for subtle look or add pressure for darker, bolder look. Blends with most hair and skin tones. Pre-shaped left and right side stamps. Two shapes to fits all brows -structured arch stamps and soft arch stamps that snap into top of compact for easy storage. Water resistant coverage that lasts all day. Includes Brown makeup compact with mirror, 2 structured arch stamps, 2 soft arch stamps. I love this item! It seriously only takes 3 seconds once you practice and get it down. It has helped to cover up the gray hairs in my eyebrows. Did not like this product. It sounded like a good idea. Although to get everything line up not as easy as it sounds and not get too much color on isn&apos;t as easy as it looks either. May somebody else can get it right. But it&apos;s not for me. Not impressed. Kind of smugdy. Will keep trying to get a smooth line though. I think it&apos;s overpriced. Still working with it !!! !